There we were, some sixty mostly foreign journalists, brought together in a large tent in the newly opened state refugee camp for Syrians. We were listening to the governor of Suruc, Abdullah Ciftci, who was pointing out how wonderful the camp was. I didn’t get all the details of what he was saying, since I wasn’t sitting close enough to hear. And, to be honest, I didn’t want to be there at all, just like, I can safely say, any of my colleagues. We were all just wondering about one question: when does this charade end? Journalists on a forced tour in the state refugee camp, talking to the governor. click to enlarge. We, the journalists, had been pressing the governor’s office to allow us to cross into Kobani for a reporting trip. We were modest in our wishes: if we could have a few hours there, we would be satisfied and we could make our stories. Last week on Wednesday a group of journalists had already gone in, and we claimed the same right. But apparently there was something about the first group. Their entry into Kobani went somewhat awry, and according to the governor’s office some of the reporters in that group didn’t get back to the Mürsitpinar border gate on time. This angered the authorities. That’s also what the governor’s energetic press officer told us when our group met him to discuss our wish to go to Kobani. It felt like a collective punishment: because our colleagues who crossed the border on Wednesday apparently did something wrong, it remained to be seen if we could enter Kobani at all. Then, suddenly, the press officer started complaining about how none of the journalists showed any interest in the newly opened state refugee camp. Why hadn’t he seen any reports about the camp – capacity 40,000, with refrigerators, beds, blankets, air conditioning, heating – in the international press since it had opened? Maybe he first meant it as a joke when he said that we would first have to visit the camp before we could cross into Kobani, but it must have suddenly struck him: good idea! They want to go to Kobani so desperately, they’ll put up with this! But when he suggested it, we had no clue yet that he would actually push the idea through. We believed the press officer, when he told us to assemble the next morning, Friday, at 10.30, and then he would take us to Kobani, ‘80% sure’. The next morning around 9.45, when I was having breakfast with the Suruc family with whom I had stayed the night, I sent a text message to one of my colleagues: ‘Any changes in the plan? Did the press officer contact you?’ He texted back: ‘Yes. Refugee camp, 10am. We are on the way.’ I choked in a sip of tea, jumped up to brush my teeth and pack my bag, said goodbye to my hosts explaining to them why I was suddenly in a rush, walked quickly to the city centre, jumped into a cab and asked the driver to take me to the new refugee camp as soon as possible. I can be stubborn, but when all I need to do to get into Kobani is to show up at a compulsory tour at a state refugee camp, I switch on my smile and go. Mustafa Derwish. click to enlarge. As the governor left the row of tents with the group of journalists clustered around him, I and some others stayed behind to talk to some refugees. 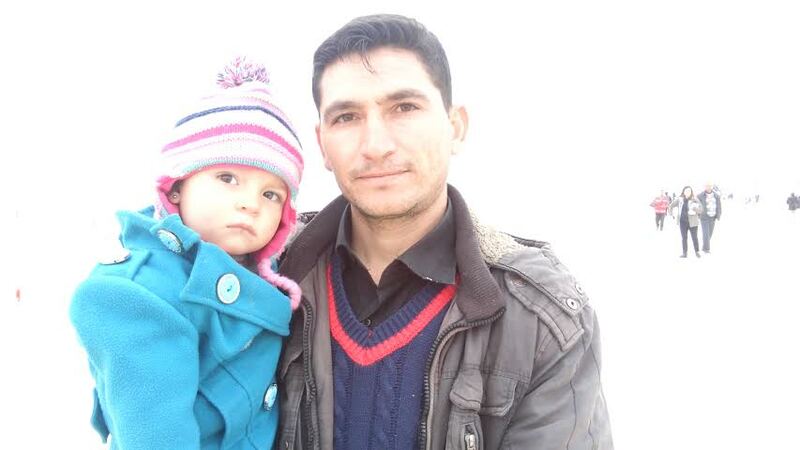 I talked to Mustafa Derwish, who had his toddler daughter on his arm. ‘I thought the journalists would come to talk to us and would be interested in our sufferings, but they don’t ask us anything’, he said, disappointed. I asked him if the Turkish state provided him with a good tent. ‘The tent is fine’, he said. ‘But I don’t want a tent here. I want the Turks to open the border to Kobani.’ Meanwhile, the governor’s press officer was gesturing at us stragglers: stay with the group! I don’t think it was part of the plan we would talk to the people unattended. In the tent, after this toe curling charade which served no purpose for the refugees at all but was meant solely for the glory of the state, there was time to ask questions to the governor. I wanted to ask him for his reaction to what Mustafa Derwish said about opening the border, but it was 11.15 already, and I knew we wouldn’t be allowed to stay in Kobani after dark. The priority now was to get out of the camp and into Kobani as soon as possible. The press officer told us to put our names on a list if we wanted to go to Kobani, and then we would meet at noon at the gendarme road block before Mürsitpinar border crossing. I think that anyone whose name was not on the list, and thus hadn’t visited the camp, wouldn’t be allowed in. This was a package deal: refugee camp and Kobani, or neither. 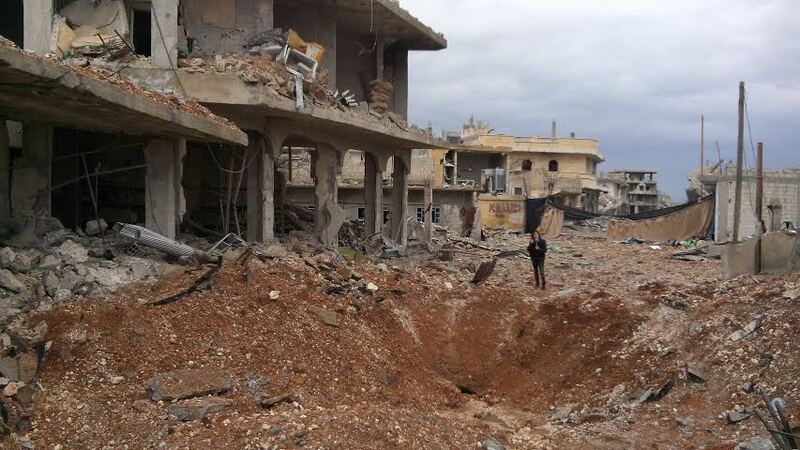 Destruction inside Kobani, and a French journalist reporting it. click to enlarge. Don’t get me wrong: I am not against the state camp for Syrian refugees. The facilities seemed good, at least as far as we could see in this short compulsory tour. Many refugees from Kobani with whom I have talked over the last four months want to eventually return home, and now, like Derwish, they want Turkey to open the border. Now that I have seen Kobani (yes, we did get in! ), I know they have no clue about the total destruction that will await them there. Shelter in Turkey will be needed for at least the next couple of months. I am curious how this camp will evolve in the next couple of months. Only 5,000 refugees find shelter there now. Will it be full? But more importantly: will the state listen to what the refugees really want, which is not a fridge and air conditioning but to return to Kobani? If so, will Turkey wholeheartedly contribute and facilitate the rebuilding of the city, so that in time, people can really go back home? Will they open the border as soon as possible, so people who want to contribute to the rebuilding of Kobani can go there unhindered, and goods such as food and construction materials can pass? I have my predictions, based on President Erdogan’s remark last week about not being able to accept ‘a northern Iraq in northern Syria’. Meaning: he won’t accept self governance for Kurds in Syria, like they have in Iraq. I will write about the camp. But it won’t be state propaganda, but journalism. One colleague called it ‘smart’ of the press officer to manipulate the foreign press to the camp like this. I don’t find it smart at all. They can force us to the camp, but they can never control what we write about it. You may or may not appreciate Turkey’s efforts to build these camps and host these people in need, and some of these people (e.g. the one person you talked in your visit) may want to return back to Kobane but that does not take away the immediate need for these camps at this moment. How does your native country (or EU for that matter) support the immediate practical needs of these people in need? Can you please give one concrete example? I think you have a real propensity to politicize every little issue in the name of journalism. What are you talking about? They are behind ISIS, and when they started to build this camp they never thought by the time it will be finished Kobane will be free. How many times should we accept to be forced to bow for the devil kindness? I don’t think the point of the story is to criticize the refugee camps in any way (the story shows that there are nice new refugee camps being built by the state). It is to show a state propaganda machine at work and show the day-to-day obstacles of journalists looking for some truth. As suggested, one truth that must be sought is whether Ankara plans to encourage or discourage the rebuilding of Kobani. ah, so only turkish citizens can criticise refugee issues in turkey? or only citizens of a utopian country? conversely, are turkish citizens only allowed to criticise countries that are “worse” in the criticised area than turkey? by the way, if the EU *did* treat refugees “ideally”, would you accept any and all criticise from EU citizens on refugee issues? i, and all foreigners, await with baited breath your explanation of the rules of engagement, which of course you will never change when you want to criticise a foreign country, so that we can make statements on a given issue without being labelled hypocrites. Ever needed a proof that no good deed goes unpunished? Well here it is! It takes a lot of money for a developing country like Turkey to build a big camp like this, but here you have people criticizing because of the ‘who’ not the ‘what’! 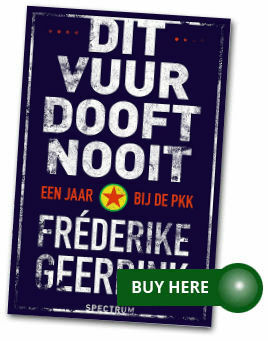 If the PKK built this camp, I have no doubt the author would go nuts over it! Impartial, eh?! They should not restrict this camp to kurds-only or kobani-residents-only. It should be available for all refugees regardless of religion or ethnicity. I’m not sure what you think the Turkish government should do for these people. What else could they do, please give practical actions, not vague ideas. They’re given emergency shelter, food. They’re safe in Turkey. What else should Turkey do? Do you expect the Turkish army to go into Syrian soil, fight off IS, make Kobani a safe place, then send in construction companies to build a new city for Kurds? Should they train Kurds, give them tanks, artillery, helicopters etc? Next Next post: Why does my writing scare you and the government you work for, Akif?